Don't we all love a cheeky little monkey! 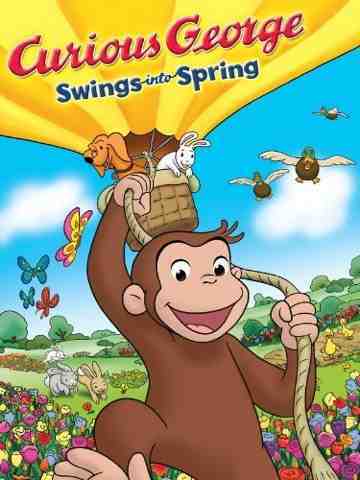 My two little ones really enjoyed watching Curious George Swings into Spring - I was surprised that Meg (nearly 2) asked for this film on a lot ... It's usually Blake (nearly 4) who puts the requests in! I found it was one of those precious DVD's that I could pop on and know it would keep both little people entertained. There's lots to satisfy Blake's curiosity - he loves learning about spring - he asks a lot of questions! There's a song in the film dedicated to sausage dogs which Meg bops along to and giggles away at the scene with George in a hot air balloon! We love Curious George because he's very loveable and the DVD is full of adventure, entertainment, curiosities, songs and enjoyable story lines! This DVD has just been released on 20th May just in time for half term! Spring has sprung and the world’s favourite monkey returns – as curious as ever – in this high-flying, full-length feature. George and his best friend, Hundley, explore all the wonders of the season together – including blooming flowers, baby animals and canoe rides. But when Hundley loses his way and gets lost in the countryside, George takes to the skies in a hot air balloon to find his pal, in a wild adventure that ends with a very fun surprise! Finally, to George’s delight, Hundley now has spring fever, too! Gently paced, educational and entertaining, Curious George Swings into Spring is ideal is pre-schoolers. * I received a check disc copy DVD so that I was able to review it. I've not received any payment or compensation for this review.